I like to think of myself as a versatile reader because I enjoy both simple and the toughest of reads. When it comes to simple books, I am quite a big fan of Durjoy Datta, Sudeep Nagarkar, Ajay K Pandey etc. 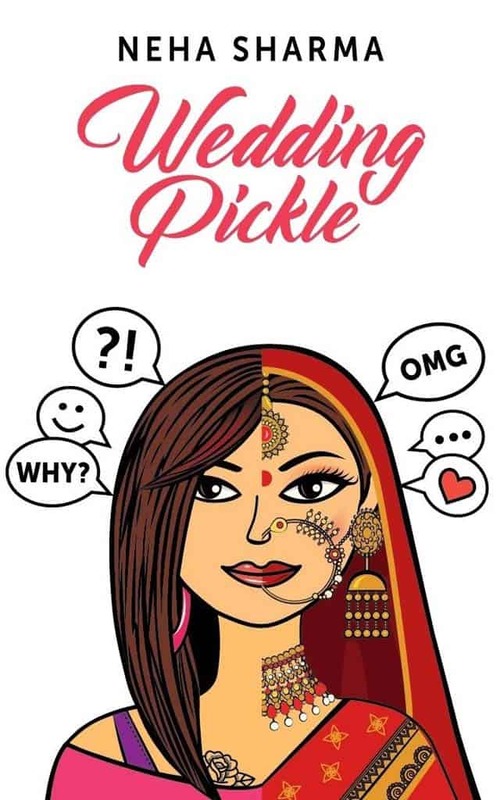 Wedding Pickle will fall into the category of a simple read because, in the end, it is a simple story about a girl’s tryst with match-making and marriage. Avni is a bubbly and vivacious woman who is quite happy with the way her life is going. At the young age of 24, she is quite satisfied with the direction her life is taking. A nice cushy job, a good number of friends, loving parents, a nice cosy apartment with the world’s best roommates and, a great social life – Avni has it all. She couldn’t have asked for more but there is only a slight glitch. Ever since she crossed into her twenties, marriage is one topic which never seems to leave her alone. Everyone, from her mother to father to her many relatives, seems to have only one agenda – to get Avni married. Avni, however, is sceptical and not yet ready. When one fine day, after a lot of convincing and emotional blackmail, she finally agrees to see a guy, she finds out that things will never be the same again and there is no coming out of the situation that she has allowed herself to get into. Afraid, sceptical, and unwilling, Avni slowly finds herself coming to terms with her fate. Wedding Pickle tells us the story of Avni and her marriage. Wedding Pickle has a pretty straightforward plot. The story is of Avni and that is the only plot in the book. It follows a simple trajectory; there aren’t any twists, turns or any subplots to speak of. This, in a way, makes the book somewhat monotonous and insipid, after all, who doesn’t love a surprise? The characters of Avni and Ansh are decent. The chemistry that they share is just fantastic and something which will make your heart melt. Avni is a character who gives the reader some mixed vibes. Reading about her and delving into her life is a kind of a bittersweet experience. On one hand, she is quite stubborn, a little irrational and somewhat irritating, while on the other hand, her story and her inhibitions regarding marriage are quite relatable. Ansh is a different story altogether. This book is basically meant for girls and Ansh is one character with whom all female readers can easily fall in love with. He is basically the guy whom every girl wants. Smart, humble, caring and very loving, he worships Avni and doesn’t shy away from making it obvious. Other characters are also interesting. Avni’s besties are what every girl aspires for. The kind of easy camaraderie and companionship that she shares with her friends and roommates is enough to give any reader some tough friendship goals. Wedding Pickle will appeal to the masses but more so to the female readers. Neha’s writing style combines romance and chick-lit in an almost effortless way. Her strength as a writer lies in making the book appeal to a large number of readers with the help of a story which celebrates women and their flaws. Her characters, unlike the characters of many other female-centric novels, aren’t flawless but are a more realistic representation of today’s woman. I also enjoyed the way Avni’s story and her apprehensions are so relatable. In addition to this, Wedding Pickle very subtly aims to help many young women who have similar fears and share a fate similar to Avni’s. The climax is where the book loses points. It is cliché and totally predictable. Since this is the case with most chick-lits and romances, to a certain extent it can be excused. Still, I would have loved it if the book had at least a couple of unexpected twists and surprises. Overall, Wedding Pickle makes for an entertaining read but it doesn’t offer much in terms of a literary-high. It is a story which has been told numerous times by many different authors but Neha Sharma’s characters make up for the repetitive story and give this book a touch of class. You are in your early twenties and not yet married. You have reservations and apprehensions about getting married and are not really looking forward to the whole business of marriage. You are looking for a simple and entertaining read. You are looking for more literary value in a book. Can’t wait to read it? Buy your copy using the link below. Your reviews are so good. The way in last you sum up who should pick this book and who should skip it. I’m not much a fan of chick-lit, but yeah love to read this one as I’m also in early twenties and have restrictions for marriage. So, may be I will pick it. It will be something different to read. ? Thanks for the review. Hey Richa. It’s a good book in the sense that it will allay your fear of marriage if any. Overall, it can be a little monotonous if read at a single stretch. and thank you, dear, for your lovely words.